I just got bored from Miku and decided to do something different( really this time...). As always, I played with brushes for half an hour. After making the bg, I found the character( unfortunately I couldn't tell which K-ON member is she). Then wrote the script. Here is the result. *Brushes are from here as always. PS: Second version is the same walle with a yellow texture layer addition. Great wall. I really love the background. 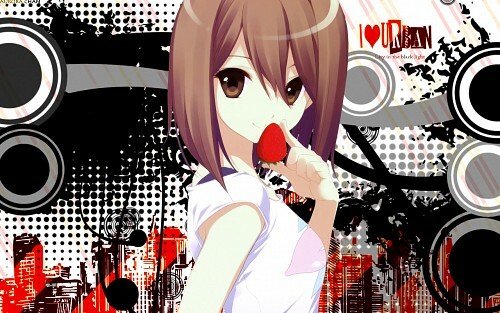 Gives a cooler look to yui. Very nice wallpaper, i really wish it was available in higher resolution. How I wish this wallpaper is available in higher resolution (maybe 1920x1080? =P). Nice & Lovely, Thank you for sharing the wallpaper! Yui came out so matured. Nice!